Longmeadow became an upscale community with an exceptionally high quality of life because of its residents’ shared values, among them shared (participatory) governance and shared interests (economic and otherwise). The notion of “commonwealth” was deeply engrained in the people, institutions, and ethos of this place. The persistence of our participatory form of government (Town Meeting) serves as an institutional reminder of the Tocquevillian notions of citizenship and community that survived largely unchallenged in Longmeadow until at least the early 1980s. The so-called “me” generation that came to the fore in the 1980s was clearly a significant challenge to the notion that community welfare should precede individual welfare; a notion concisely identified by the great French chronicler of American Democracy as “Self interest, rightly understood.” The worst misfortune to befall our close knit New England town was, however, not merely cultural, or even ideological, it was structural. It was a very permanent and very inflexible change in the rules of self governance, the unintended consequences of which are now being felt acutely in our town. The passage of “Proposition 2&1/2” in Massachusetts, by the direct democratic mechanism of a state-wide ballot initiative, is one of the most significant sources of Longmeadow’s declining fortunes. Direct democratic procedures emphasize individual rights and the “one man, one vote” principle. They are only supportive of “commonwealth & community” when the community understands itself as sharing a moral, ethical, or values consensus. This kind of consensus mitigates the tendency toward lowest common denominator politics and mob rule that can and does tend to infect direct democratic procedures. Thirty years ago Longmeadow was a community of families that shared an overarching commitment to the welfare of the community that was most concretely expressed in a commitment to the highest quality of public education in the region. The connection between our schools and our honor; our schools and our values, was the source of Longmeadow’s cherished identity, excellent reputation, and superior quality of life. The imposition of this divisive anti-community political instrument has done more than any other single thing to reduce the quality of life and community in Longmeadow. The “canary in the mine” in this regard is, of course, the quality of education in Longmeadow schools. A comparison of Longmeadow schools in 1980 with those of 2010 reveals a system that has been gutted of nearly all the programs and opportunities that made our town’s schools the envy of the region. Did Longmeadow residents gradually lose their commitment to education as the primary linchpin of community? Not exactly. What changed was not our understanding of the importance of education, it was our understanding of citizenship and community that was transformed; a transformation furthered by this radical changing of the rules – prop 2&1/2. The anti-government wave that swept over the country in the 1980s was not different in tone than similar anti-government movements that dot our nation’s history. Indeed, previous such movements were supportive, not destructive, of close knit communities that saw themselves as bulwarks against the storms of individualism and self interest “not” rightly understood. The difference here was the imposition of an individualistic rule that would encourage residents to consider their membership in the community differently than before; not as family members, but rather as “consumers” of services produced by the “government.” Proposition 2&1/2 was the legal/political equivalent of allowing the kids to vote on the resource allocation decisions of the parents. It produced narrowly self interested fissures in the community that made rational public deliberation and decision making about the town’s long-term interests nearly impossible. It encouraged intra-community rivalries the likes of which were once only seen between communities. The now well understood transition across American society from close extended families to the dominance of closed nuclear families was playing out at the community level and was facilitated and legitimated in our town by legal sanction in the form of Prop 2&1/2. The perceived value of the “village” and its role in the lives of every family in the community has eroded to the point where we now snicker at the politicized version of this proverb with no consciousness that it was once the primary source of our town’s uniqueness and higher quality of life. Today in Longmeadow our strong community spirit animated by shared values is little more than an abstraction found only in our rhetoric and our lamentations. To a person, I expect that residents long for a sense of shared purpose and shared values among the townspeople. In an era of economic complexity, scarcity, and risk, there is indeed strength in numbers. Ironically, today this strength’s greatest manifestations among ordinary folks- close self governing communities, labor unions, churches, social and service clubs- are too often rejected by the very people who need them most. In 2010, Longmeadow has a form of government designed for commonwealth but a citizenry attuned to the market place. We have citizens who want consensus, but whose actions (and inaction) unintentionally foreclose that possibility. The rise of the “consumer-citizen” in our town has gradually stripped us of our unique identity and our higher quality of life. By legitimizing, indeed mandating, that each household be enlisted to approve even modest local revenue increases, often increases that don’t even keep up with inflation, Proposition 2&1/2 has helped destroy effective collective self governance by elevating private deliberation, animated by narrow cost/benefit analysis, above public deliberation, animated by shared values and interests. Nothing understood as a “public” good can be a source of unity, familial bonds, or even civic friendship, if its provision is subject to the norms and values of the marketplace. Our town’s beauty, safety, education, and even administration ain’t what it used to be, not because our public servants are less skilled (they are highly skilled), but because our community’s expectations are no longer expressed as shared purposes, shared values, and shared interests. The Longmeadow School Department and School Committee face some difficult staffing and program decisions in order to meet the expected budget reductions requested by the Town Manager. I attended the Public Forum on the School Department budget that was held this past Monday (2/08/10) to gain a better understanding of the upcoming school budget and its consequences. Jahn Hart, Longmeadow Superintendent of Schools presented the public forum with a detailed overview of the proposed FY11 school department budget. Here is a link to the proposed FY11 school dept. budget. The proposed FY11 total school budget is $30.09 million which is a decrease of $1.55 million dollars from FY10. Because of reduced special revenues and mandated increases, total reductions to the school dept general fund were $1.86 million. A total of 35.35 positions would be eliminated which is a reduction is ~ 8% of the total staff. One of the areas for reduction was the elimination of the “pull out” instrumental and choral music program at the elementary school level and elimination of the orchestra music instruction at the middle school level. There was also a reduction of music related staff at the high school which would decrease the number of course offerings. District-wide there would be a total reduction of 2.2 music related positions (out of a total music staff of 10.3). Most of the public comments during this forum including impressive presentations by numerous middle and high school students as well as parents of music students centered upon the reduction in the music program and related staff. Suggestions by students and parents of a “fee based” music to allow its continuation were rejected by the School Dept since this portion of the music program (different from general music classes) is not allowed because it is a core offering. Obviously, eliminating instrumental and choral music programs elicits a strong emotional reaction. 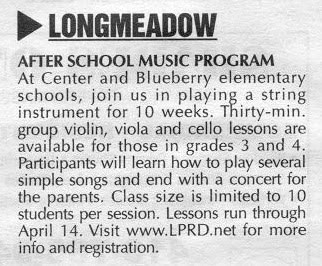 Perhaps, offering of such programs through the Longmeadow Parks and Rec dept as an after-school fee based programs could replace the “pull out” music and choral offerings. In this week’s Reminder, there was an advertisement for the following after school program. Perhaps, we could hold onto these important music related programs through “non-school dept” offerings. I raised a question about prioritization of cuts and was told that the School Dept and School Committee had developed a priority list of cuts but was not going to make it public. Given that state aid to cities and towns is in flux and subject to change, I think that this information should be publicized so that the public could provide some input to the decision making process. Below is the related Q/A on this subject. This is only the beginning of a long final budget formation process for FY11. Stay tuned to Longmeadow Buzz for the latest developments and insights.